I don't normally get excited about gaming systems. For the HP Firebird I'm making an exception. HP has done something interesting by rolling out a high performance gaming PC with a highly reasonable price. The system ships with 3 video cards, that dynamically turn on based on what you're doing. If you're playing a graphics intensive game, the Firebird is likely to crank up the GPU performance to give you better frame rates. If you're editing video, you're also likely to get more dedicated video card performance from your computer. For under $1800, this machine will blow the doors off many competitors priced in the $3k range. For about $300 more, you get some visual bling and even more horse power. 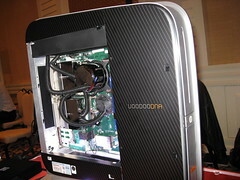 One unique feature of the Firebird design is the power supply is on the outside of the case, similar to a gaming console. This means you get less heat and less noise from inside the case. The dynamic nature of the video performance also means you should use less energy than a standard setup where the graphics cards are always on.